Our services do not end with recommendations. Strativa consultants can stay involved to help carry out those recommendations in four ways: project management, change management, process improvement, and vendor management. Project management is a key discipline needed to carry out strategic business initiatives and to implement new technology. Yet, many companies do not have the experience to manage major business improvement projects or new enterprise system implementations. As a result, projects often take longer than necessary, cost more than planned, and do not deliver all of the promised benefits. Strativa consultants have experience managing large and complex projects. Our program and project management toolbox contains a variety of practical methodologies and project management best practices to ensure success. These include project chartering, project planning and scheduling, work breakdown structure definition, cost and schedule tracking, and project status reporting. Strativa project managers can come in to directly lead client projects or they can serve in an advisory and coaching role to your in-house project manager. In addition, we can assist the organization in developing those core competencies and processes needed to effectively manage such initiatives in-house in the future. Successful implementation of a new business initiative or a new system requires more than project management. People are the actors in business processes, and they are the users of information systems. If processes and systems are changed, then people must also embrace those changes. Therefore, management of change is a key factor of success in carrying out any major business initiative. Our consultants can assist in a variety of change management activities, such as sponsorship planning, team building and coaching, education and training, assessing and overcoming resistance, and communications programs. For those clients that require organizational change, we can also assist in organizational design, skills planning, and talent acquisition. Invariably, implementation of a new information system has a wide-ranging effect on an organization’s business processes. Successful implementation of a new system is not just about ensuring the technology works. It is also about changing and improving the business processes that are supported by that system. Our process improvement services can form an engagement of their own, or they can be incorporated as part of our support for new systems implementation. Strativa maintains a strict independence from technology providers, which qualifies our consultants to objectively evaluate their solutions. This independence also allows us to help our clients manage vendor relationships during implementation. Our vendor management services can include independent review of vendor implementation plans, independent evaluation of vendor work products, and facilitation of conflict resolution. 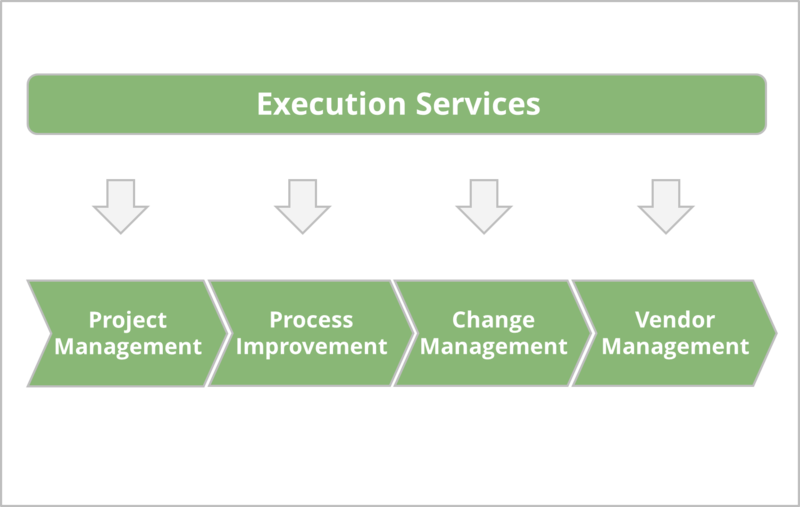 The following free resources provide insight into our execution services. Download: The Whats and Whys of an IT Service Catalog→ Our IT consultants have particular skills and experience in designing and implementing IT service catalogs. This special report outlines basic concepts behind the IT service catalog.